Generate Fake Snapchat and prank your friends by sharing the generated image by our Generate Snap-chat Tool. Upload picture, make a screen-shot as you like with our tool and astonish your friends. 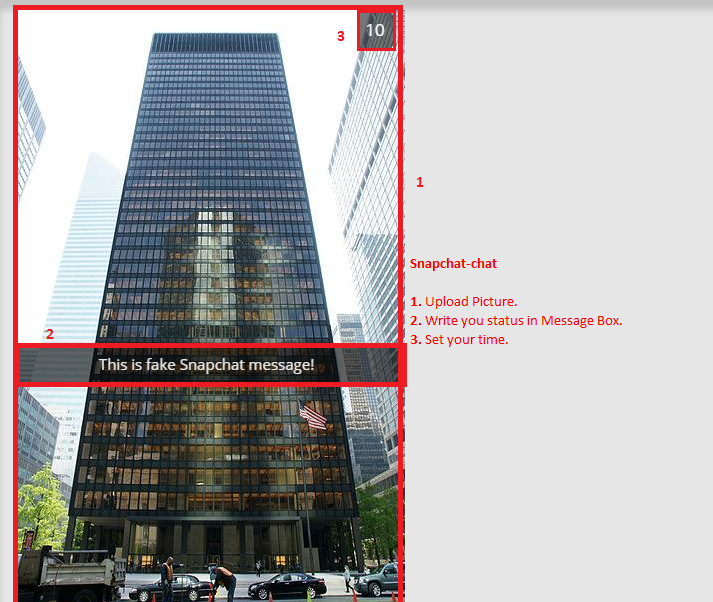 Use our Fake Snapchat Generator Tool and prank your friend on all social media platforms. It’s easy to use and very simple, but having latest snapchat layout and design as well as icons and buttons. How To Generate Fake Snapchat Maker? Make the post like you want then click on “Save” button to save your generated Snapchat. After some time two more buttons will show up under the “save” button. (Picture uploading can take some time so be patient and wait for the share buttons to appear under save button for some time One button will share the post to your profile directly other will save and download your status/post as an image on your computer. best tool i used ever, please update it to become compatible with latest snapchat update.